Today the PokerBat is going to look at one online poker donk hand. Did you know the Poker Bat can be a Poker Donk? Yes, apparently when the Bat sits down to play online poker, a donk can come down from heaven inhabite the Bat’s body and make the Bat play like a donk. Wait a second Donk’s don’t go to heaven. Donk’s come from and go back to hell. So, it’s demon donk that infests the Bat. So, a possessed Bat playing poker online gets taken to school. Let’s look at the hand it all it’s marvelousness. Clipped right below with no names changed to protect the innocent because there are no innocents. What’s the first Donk move the Bat commited students? If you said raise 4x from early middle position you are… wrong. The first Donk move was the Bat played online poker that day and allowed himself to get a demon donk to take over his mouse clicking hand. Okay. Raise may not be optimal there but it isn’t terrible and the donk doesn’t always do it, so file that excuse under changing up the Bat/donk’s game to throw off his opponents which incidentally aren’t even paying attention. Don’t worry the PokerDonk would do something to get their attention just a big later. The next mistake in this miserable hand was the opponent led out on a flop that had three over cards to the Poker Bat’s pocket 7s. Including an Ace, which makes sense for the guy to hit his ace and call the preflop bet. The Bat, wrongly as you’ll notice is the theme today, calls that raise. The excuse for this idiotic move, is worse than the first excuse. The Bat thinks the guy would lead out if he hit he ace (why would he try and get paid). The Bat decides he’s going to float this bet and try to steal it on the turn. Turn throws up the third spade. But it’s the 7 given the Bat a set. Sometimes it’s fun to play like a donk because the Bat gets rewarded like a donk. Boom! Goes the dynamite. Now, for the next mistake, the Bat’s lost count so you are on your own for that one. Clearly the opponent is scared of the spade and checks to the Bat. The Bat checks when he hits his hand because the Bat doesn’t like to get paid off when he makes a hand. Similar rationale to why the Bat thought his opponent wouldn’t lead his hand on the flop. Yeah, the Bat is a regular genuis. The river is the 9s putting four to a flush on the board. Mistake number 1000. The Bat just got countefeited. Whoops. Online poker is for donks. So when the other donk in the hand checks, the Bat checks behind. In case you didn’t notice the Bat just checked a full house. Classic chance to lead out a weakish bet that a formely strong hand has to call, or might induce a bluff from the opponent. The Bat opted not to do that. Why not check a full house there. Clearly there are 4 of a kinds, bigger full houses, and straigh flushes to be scared of, especially considering the betting pattern. Okay, that was a window into the Bat’s soul. The Bat doesn’t make mistakes too often but now you know on some days when the window to hell spits up a demon donk and it inhabits the Bat’s body, the Bat can play bad too. So, the Bat goes to his old school home games in the last week or two. That Bat took a break from killing the online poker world long enough to knock on some old doors and try to find some old friends. Talking really old school games, where the Bat played with kids barely old enough to stay out after dark. Those kids would take the Bat for a bankroll back in the day but these days the Bat’s all grown up. The Bat doesn’t play in the kidde games anymore but learned a lot back then. The Bat learned pretty quickly strong is weak and weak is strong. Ever notice kids lie badly but they always try to deceive, deceive, deceive, and they never stop even if it’s obvious the jig is up. They’d shake their heads like they got dealt rags but the Bat would know they were sitting on a monster. It couldn’t be more obvious if a blue, shaggy arm with a mitten paw holding cookies was reaching out from under their seats. The kids did fool the Bat at first, but the Bat soon picked up their ways and started treating them like Adam Sandler and a dodge ball. The weird thing the Bat learned was some bad players never learn. These children would try the same tactics every time. Take pipsqueak Pete every time he’d shove all in, he’d say, “I think I hear my momma calling me for dinner, I got better things to do,” and get up like he was leaving. The Bat knew to insta-fold. Some of the Bat’s favorite tells are always exaggerated by kids. The bad acting like the hearty exhale when it’s clear their decision was over. Mike Matusow once said, “The kiddie game’s down the street.” The Bat knows all about the kiddie game, only problem the kiddie game doesn’t pay quite as well. Let’s the Bat be honest, when first playing penny nickel stakes those kids won comic book collections from him, lunch money for a week, and the keys to the car he’d get at 17. The Bat did get an edge in that one saying the kid just won the keys to the the car not the car itself, but the Bat won the keys back just in case there were any lawyers trolling the 3rd grade for clients. What’s the point for this jaunt down memory road? The Bat went back to this old haunt and there was nary a soul in sight. Looked like the kids had all grown up and moved out of town. Beanie’s mama wouldn’t even let the Poker Bat in when the Bat went knocking. Those were some good times though. Now, the Bat has to find his under 21 opponents online. Problem is those obvious tells are cloaked by a computer monitor and those kids are probably yelling out their hands. 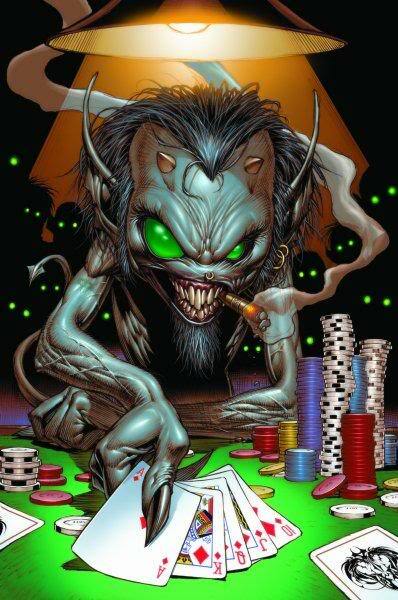 It’s one thing for the Bat to lose to an adult these days but to log on and play poker online and have the likes of the kids the Bat used to own when… he was a kid (did you catch that part, that the Bat wasn’t some perv playing with kids, that the Bat was a kid too? Come on reader the Bat expects more from you). So nowadays, all those reverse tells are useless. The Bat plays this zany kids that will shove with any two cards and the Bat can’t say he likes this new younger style of play. These kids grow up on video games like Starcraft and Duke Nuke’em and Halo and River Raid and then think the online poker is just another video game albeit with bad graphics and a poor soundtrack. Anyway, the Bat can’t wait til these kids get of age, because they might be running well against the Bat right now, but they could never do it face to face.